In addition to the structure of the non-flaring Sun, radio emission is exquisitely sensitive to flaring emission. Let us define such emission to be any brightening with time variability on scales shorter than a few hours. Of course, the Sun is continuously variable on all timescales, so this division is somewhat arbitrary, but it will suffice for our purposes. The brightening can take on a fantastic range of forms, from a slight increase due to heating (thermal emission) to 1000-fold increases in seconds or less. We have already discussed the radio emission mechanisms that are important -- free-free emission (bremsstrahlung), gyrosynchrotron emission, and plasma emission. Gyroresonance emission could also be produced due to heating, of course. All of solar activity arises due to the solar magnetic field. There is a famous saying, attributed to various people, that "If it did not have a magnetic field, the Sun would be as uninteresting an object as most astronomers believe it to be." But fortunately for us, it does have a magnetic field, and so produces a wonderful variety of phenomena that are interesting to study -- and that are also important -- since solar activity affects us directly in many ways here on Earth. The solar flare starts with a period of energy storage, called flare build-up, that can occur over a period of days, but often results from the eruption of new magnetic flux from below the photosphere, which can take only hours. The stored energy takes the form of a non-potential magnetic field distribution. During this time, the changes take place in conditions of ideal MHD (ideal Magnetohydrodynamics), meaning that there is a balance of magnetic and gas pressures, and the field lines are "frozen in." Once conditions in the corona are right, the magnetic field can release its energy, sometimes in seconds, through a mysterious process called magnetic reconnection. In this process, the field lines are cut (something normally impossible in ideal MHD) and reconnected to a lower-energy configuration that is closer to potential. The difference in energy between the original non-potential configuration and the resulting, more potential configuration is available for mass motions, acceleration of charged particles, and generation of waves. What we call the flare can represent the immediate release of energy, the initial heating and acceleration of the charged particles, and all phenomena associated with the resulting mass motions and subsequent thermalization of the particles. One associated phenomenon is the Coronal Mass Ejection (CME), which is a magnetic bubble that becomes unstable and buoyant, leaving the Sun and propagating out into interplanetary space. There is a lot of argument about the relationships between flares and CMEs. The old assumption was that CMEs were the result of the flare, but timing studies are ambiguous and there is at least as much evidence that CMEs cause flares! In fact, both flares and CMEs can occur one without the other, so it is perhaps best to consider them related but separate phenomena. The figure below shows a schematic view of the relationships between the different components of a flare, somewhat late in its development. 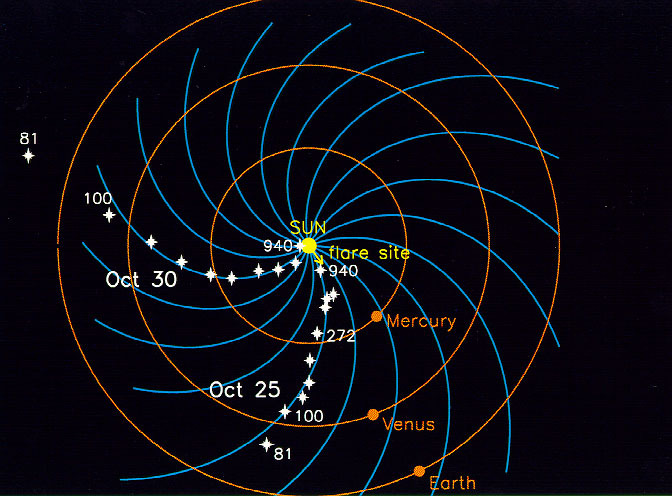 The point marked "acceleration site" is relatively high in the corona, and is the point where reconnection is taking place. Loops labeled MW and SXR are the locations of the microwave and soft X-ray sources, respectively. These are recently reconnected loops, with overlying loops being most recently formed. Here is a movie of 2D reconnection of the type illustrated. The part of the diagram at right shows a schematic of what actual radio observations show -- type III bursts going upward, RS (reverse slope) bursts going downward, and DCIM (decimetric pulsations) at higher frequencies. You can see that the region sampled by the decimetric range of frequencies (300 MHz to 3 GHz) is a very interesting one, since it covers the typical range of heights corresponding to the reconnection region. In fact, for historical reasons the part of the spectrum from about 400-1000 MHz has never had high-resolution imaging, so the spatial structure of sources in this band remains largely unknown. FASR will be the first to image this region in detail. cause is a shock wave, propagating at 500-2000 km/s outward into the corona into interplanetary space (also seen down to kilometric wavelengths). type III storm -- a long lasting (up to a day or more) series of type III bursts, RS (reverse slope) bursts, reverse-drift pairs, and continuum. stationary type IV -- broadband continuum emission, sometimes highly polarized, due to either plasma emission (o-mode polarized) or gyrosynchrotron emission (x-mode polarized). moving type IV -- a similar cause, but entrained in a CME or expanding arch. cause is slower type III-like electrons in widely diverging magnetic fields, with both forward and counterstreaming langmuir waves, perhaps generated by previous passage of type III electrons. One can observe type III bursts propagating all the way to Earth and beyond, as we saw in the earlier homework problem. By using a spacecraft equipped with a rotating dipole, the direction of the emission can be determined, and its frequency (proportional to square root of density) gives its distance from the Sun (using a density vs. distance model). Here is an example of tracing two type III bursts from the Sun out into the IP medium. You can see how the electrons trace the archimedian spiral (Parker spiral). There are several useful diagnostics that can be deduced from gyrosynchrotron emission. As we discussed in Lecture 3, the emission is broadband emission, with optically thick emission at low frequencies (typically 2-5 GHz), optically thin emission at high frequencies (>10 GHz), and a peak around 5-10 GHz. The peak frequency is related to the magnetic field strength and number density, the optically thin spectral index is related to the electron powerlaw index, and the polarization tells us about the direction of the magnetic field. The sensitivity of microwave emission to these parameters makes it a useful complement to other measures of the accelerated electrons, i.e. hard X-rays. Before showing some examples, it is useful to examine what happens to charged particles after they have been accelerated. The goal is to understand the acceleration itself, which is fundamental to magnetic reconnection. At present it is largely a mystery how the reconnection process can accelerate so many particles in such a large volume in seconds. Let us leave the acceleration as a "black box," and see what can happen to the particles afterward. Each of the above processes affects the time profile and energy distribution of the electrons, and those electrons ultimately produce the radio emission. The acceleration itself will have a time profile that can be arbitrary, somehow associated with the reconnection rate. or it can modulate the acceleration in both time and energy (including pitch angle). As shown on the left in the figure, the propagation can also be trivial, simply transmitting the electrons to the chromosphere with only a short delay. Typically some fraction of the electrons (those in the loss cone, with pitch angle α < αo) will escape in this way. The loss cone is a function of the ratio of the magnetic field Binj at the injection point (often considered the loop top) and the magnetic field at the Bloss loss point (the footpoint): Bloss / Binj = 1/sin2αo. If both injection and propagation are trivial, then the hard X-rays produced in the chromosphere (energy loss) will mirror exactly the time and energy characteristics of the acceleration. This makes hard X-rays a particularly useful diagnostic of the acceleration process. This component of hard X-ray emission is called the direct precipitation component. trapping: Typically some fraction of the electrons (those not in the loss cone, with α > αo) will be trapped for a time. Trapping results in an integration, where the product of acceleration and injection time profiles are convolved with an exponential decay time (the loss time). Coulomb collisions (collisions between ions and electrons), in which case the collisions are energy dependent (larger effect on low-energy particles), which will flatten, or harden the electron energy spectrum over time. In this case if the original powerlaw spectral index is δ, the new spectral index after collisions will be δ − 3/2. Wave-particle interactions, in which case the energy dependence is more complicated, depending on the wave modes involved, and the electron energy spectrum will in general not be a diagnostic of the accelerated spectrum (unless the wave mode interaction is understood in detail, theoretically). The temporal relationships among injection, the direct precipitation, and the secondary precipition are shown in the following figure. You can see that there are two opposite energy dependences. The TOF, or time-of-flight, delay decreases with increasing energy (they are simply moving faster) while the trapping time increases with increasing energy (because the higher energy particles suffer less from Coulomb collisions, and so do not scatter into the loss-cone so quickly. It is within this framework that we now try to understand microwave emission from flares. The shaded component in the figure above is the hard X-ray signature from the slowly escaping electrons, but at the same time the trapped population (the ones that have not yet escaped) can be huge and it is that population that is producing the microwaves. Note that electrons much more readily produce microwave emission (which requires only small accelerations) than they do hard X-rays (which require large accelerations, essentially stopping the electrons). This means that microwaves are far more sensitive to high-energy electrons than are hard X-rays. The frequency of the microwaves is proportional to the magnetic field, so when we make images at many frequencies we see a dispersion in position, essentially mapping out the magnetic field. When we make spatially resolved brightness temperature spectra at different points along the loop, we see that different parts of the loop look quite different. 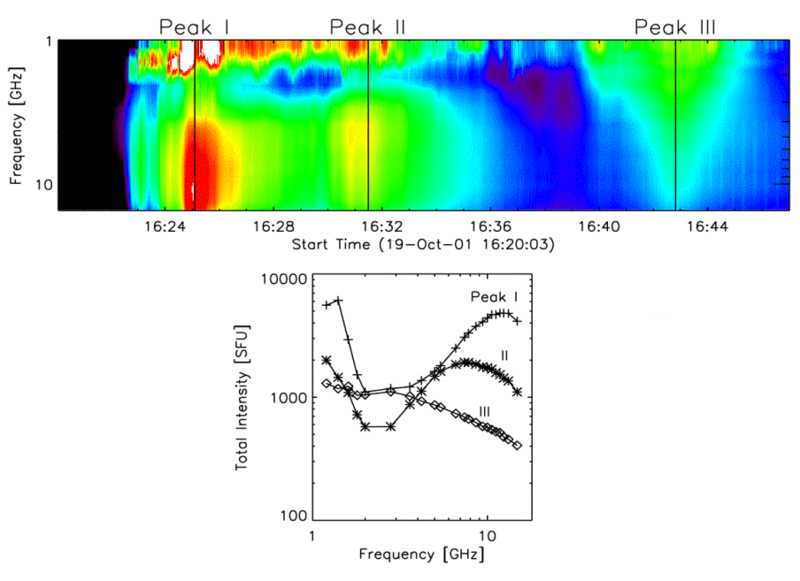 Again, the peak frequency is related to the magnetic field strength. The upper spectrum is taken at the location marked T, for "top", in the photo, while the lower spectrum is taken at the point marked F, for "footpoint". The H-alpha image shows a surge that occurred later than the flare, but we take the surge as marking the location of a large loop that was involved in the earlier flare. The footpoint may actually be the location of a separate, smaller flaring loop. The figure below gives a good opportunity to see how trapping may be reflected in spatial observations. From Lee, Gary & Shibasaki (2000) Here we see three different frequencies, 17 GHz (thin contours, from Nobeyama), 10.6 GHz (white contours, from OVSA), and 5 GHz (thick black contours, from OVSA), along with expected field line locations from a photospheric field extrapolation. This is an asymmetric loop (the right side has much higher field strength than the left side), and we see that the electrons apparently mirror at some height above the footpoints on that side.